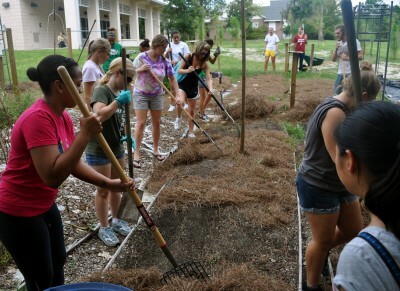 Stetson University is one of only two universities across the country recognized “with distinction” for every category of community engagement by the 2014 President’s Higher Education Community Service Honor Roll. These categories, which include Economic Opportunity, Education, Interfaith and General Community Service, are the highest federal recognitions an institution can receive for its commitment to community, service-learning and civic engagement. Approximately 900 institutions from across the country applied for the 2014 President’s Higher Education Community Service Honor Roll. Applications are reviewed based on how effectively the institutions work with community members to achieve meaningful, measurable results while placing more students on a lifelong path of civic engagement. Partnership with Volusia County Schools: In 2013-14, 190 Stetson students volunteered for over 39,050 hours in local public schools working primarily as tutors, mentors, co-teachers or afterschool program coordinators. Led by the Stetson University Department of Education, these efforts concentrated on local elementary schools with the highest number of at-risk students. Partnership with The United Way: Stetson students became IRS-certified tax preparers through the United Way’s Volunteer Income Tax Assistance (VITA) program, resulting in more than $200,000 of tax refunds for over 200 local, low-income families. Pro-Bono Service: Stetson College of Law students are required to complete at least 60 hours of legal and non-legal pro-bono work prior to graduation, which resulted in more than 19,000 hours of highly-skilled assistance to legal aid societies, local non-profits and government agencies in 2013-14. Bonner Program: Stetson’s Bonner Program, recognized as one of the premier community engagement programs in the country, provides need-based financial aid packages to more than 60 students in exchange for completion of at least 10 hours of community engagement work each week through a four-year internship with a local non-profit organization – resulting in more than 22,000 hours of work in 2013-14. More information about Stetson’s Center for Community Engagement can be found here. More information on eligibility and the full list of Honor Roll awardees can be found at nationalservice.gov.